The protagonist of the new CBS comedy Living Biblically is newspaper film critic Chip Curry (Jay R. Ferguson, The Real O’Neals). After Chip’s best friend dies, he decides to try to become a better person and thinks the best way to do that is to live according to the rules of the Bible. But reading the Bible isn’t easy. 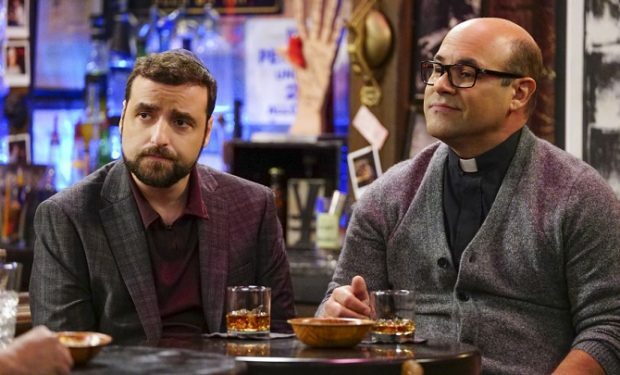 He recruits Father Gene (Ian Gomez) and his best friend Rabbi Gil (David Krumholtz, Numb3rs) to help him translate the messages and apply them to the modern world. Rabbi Gil is portrayed by David Krumholtz. Krumholtz is known for his roles on HBO’s The Deuce (Harvey Wasserman), The Good Wife (Alicia’s campaign manager Josh Mariner), Mom (Gregory), Numb3rs (Charlie Eppes), and The Closer (Bruno Verma), among others. Krumholtz is also recognized for his roles in the films Superbad (Benji Austin), Ray (Milt Shaw), 10 Things I Hate About You (Michael Eckman), The Ice Storm (Francis Davenport), The Santa Clause (Bernard), and Addams Family Values (Joel Glicker). Living Biblically airs Mondays at 9:30pm on CBS.